I need additional measurements for your pieces. Where can I find those? Your local Bassett Design Consultant or Customer Care Specialist will be able to give you additional measurements that may not be listed on our site. 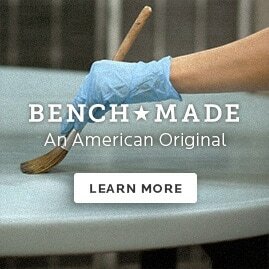 Are all of your pieces made in America? Bassett is one of the few American manufacturers who have maintained a domestic production presence with factories in Virginia, North Carolina and Texas. All of our upholstery is made in either our Newton, N.C. factory or Grand Prairie, TX factory (with the exception of certain leather items), our Custom Dining program is assembled and finished in Martinsville, Va. from both domestic and imported components and our Bench*Made line is entirely American made from Appalachian Red Leaf Maple. In an effort to meet the needs of all of our customers, we are proud to be able to offer a wide range of products, both domestically produced and imported. Regardless of manufacturing location, Bassett is involved in designing and specifying detailed product requirements for all pieces. We maintain employees in international plants to oversee production and ensure Bassett quality and all of our products meet U.S. safety standards, as well as compliance standards for California (typically the strictest standards in the U.S.). See more about the quality and care put into all of our pieces here. For more information on specific items, please contact your local store or Customer Care Specialist. Will I be able to find all of the products shown on your website in one of your Bassett stores? Our stores vary in size and not all stores will have every piece on display. Our Bassett Home Furnishings stores feature our top selling items, and usually have representative pieces of each wood furniture collection so that you can see and touch the finish first-hand. Select items are only displayed online, and will be noted as such on our website. Clearance items shown on our website may not be displayed in our stores. Please feel free to contact the store you intend to visit to ask if the item of interest is displayed there. If not, the store may be able to direct you to another Bassett store or retail partner where the item may be viewed. Are the online prices the same as the prices in the store? Our Bassett Home Furnishings stores, Bassett Design Center galleries and retail partners will honor pricing posted on the website, with the exception of our periodic Flash Sale pricing, which is available online only. Sometimes promotions or reduced pricing on clearance items or floor models may be available in stores and not available online. Can I purchase all of your products online? The majority of our products can be purchased online. Items that are shown but not available for sale online will be identified as such on the item description page. Additionally, some items you see on the website may have more options available than are offered for online purchase. Please contact your local store or Customer Care Specialist for details. The model number for wood products may be affixed to the back of the product or underneath tables and chairs. The model number for sofa upholstery products are located underneath the seat cushion. The model number for a recliner is located under the footrest. Please use these model numbers to identify your products whenever you are communicating with either Bassett or our retailers. Where can I buy Bassett Products? Please utilize our Store Locator service on our site to find the authorized Bassett store nearest you. Please utilize the Dealer Locator and contact the dealer nearest you. The dealer will provide assistance in caring for your Bassett furniture. Do you have instructions on assembling furniture? Assembly instructions are always included with the furniture. It is very important that these instructions be followed completely to ensure safety as well as the care of the item. Please contact Consumer Affairs or your dealer for further assistance if you should need it. Can I purchase extra protection for my furniture? Bassett Home Furnishings stores are proud to offer the industry’s leading furniture protection program. The Guardsman Gold Complete Furniture Protection Plan offers to clean and repair all stains and damage covered by the plan for 5 years from you date of purchase, giving you confidence and peace of mind. Authorized Bassett retailers may offer the Guardsman plan or a similar protection plan. Does Bassett accept major credit cards? Bassett does accept credit cards. For the best financing options at Bassett Home Furnishings stores, apply for a Bassett credit card. On average, our stocked or non-custom wood products will ship within two to four weeks if the items have available inventory. All of our upholstery products are made to order, just for you, and will take 30-45 days to arrive in most local markets. Please contact your selling retailer for complete delivery information. How can I order repair parts? For fastest service, contact the store where you purchased your Bassett products. They will have a record of your purchase. In some cases, parts may be ordered directly from consumer affairs. If you need additional assistance, please contact Customer Service. Our delivery is a white-glove service - it includes the preparation, delivery and assembly* of your pieces in your home, as well as packaging removal. The amount of the delivery fee will depend on the distance from our closest store or warehouse to your home. Alternatively, some of our smallest items such as shams and duvets, will ship directly to your home via Fed Ex or UPS. This fee will range depending on the amount of the order. See our delivery page for full shipping details. How do I determine what my delivery fee will be? Your zip code and merchandise total will determine your delivery fee and displays in your cart. This fee will include all pieces in each transaction and include our White Glove Delivery service. Should you need to change your delivery zip code, you do so in your cart. Am I able to pick up my order in store to avoid the delivery fee? Some of our stores are able to hold your items for a short amount of time for you to pick up. If your pieces are eligible for in-store pick-up, you’ll be given the option when you view your cart. Keep in mind that store staff will not be able to assemble or load furniture into your vehicle. Will the delivery team be able to remove my old furniture? Our delivery teams will not be able to move or remove any existing furniture. To ensure a successful delivery, we do ask that you have your space prepared to receive your new pieces. Yes. We hold our customers’ information in the highest confidence. Creating an account helps us to ensure that your order and order information are available to you and you alone. Am I able to make changes to my order? Because we understand that furniture purchases are a big decision, we do have a 24-hour hold period after you place your order online, should there be a need to change your order. Please contact the store listed on your order to make any additional changes. Please note, any Clearance or Flash Sale items are Final Sale and are not eligible for cancellation, 24 hour hold, or return after order has been placed. Please also note that this is a general policy and your state may have a different hold period than is listed above – contact your local store for details. Am I able to submit a deposit or down payment or place an order on layaway? Any Bassett order placed online requires payment in full at the time of order. Your local Bassett store or retailer may offer the option to submit a deposit when your order is placed and collect balance before delivery is scheduled - please contact your local store for details. Please keep in mind that we do offer the Bassett Credit Card and occasionally offer promotions with no-interest financing with credit approval. We want you to love your furniture! To prevent errors or concerns about design, color or measurement, we recommend our complimentary design service through our Bassett Home Furnishings locations. CUSTOM FURNITURE: Because we’re making pieces to meet your specific needs, we are not able to cancel custom orders or take returns. NON-CUSTOM FURNITURE + RUGS: Returns of these items will have a restocking fee. Please see our Cancelation and Return Policy for details. Am I able to purchase items outside of the continental US? Yes! We do have authorized retailers who offer select Bassett product outside of the continental United States. While we do not offer sale outside of the continental United States on our website, you may contact these businesses directly for pricing and availability – please see our Store Locator for available retailers. I’m a licensed interior designer. Does Bassett have an incentive program for me? Yes! We're on a mission to help you grow your business. One customer, one room, one smile at a time. Our program is the perfect match for interior and architectural design professionals who have a passion for their craft. Please see our Designer Incentive Program for details and application. I'm looking for a Bassett store near me and I can't find one on your Dealer Locator. Why? Our retail network includes Bassett Home Furnishings stores, Bassett Design Center galleries and retail partners who carry a selection of Bassett products. There may be independently owned and operated retailers in your area who have a very limited selection and are not featured in our online store locator. Please contact us and we will be happy to help you find the nearest location. How can I obtain samples of fabrics? Samples of fabrics shown on our upholstered items can be requested free of charge on our website by clicking on the small image of a fabric below an upholstered item. Our Design Consultants at your local Bassett store can also request the fabric swatches for you, as well as help guide you to appropriate selections for your project. Fabric swatches are usually received within 2 – 3 weeks of the request. Our retailers handle the service and warranty work for our products. Please contact your selling retailer should you have any problems with your products. Where can I purchase Bassett accessories? You can find these products at all Bassett Home Furnishings Stores. Visit our Store Locator. How do I become a Bassett dealer? To become a Bassett dealer, please contact our Consumer Affairs department through this site for referral. They will notify your local sales representative who will contact you directly. How do I get replacement Bassett drawer pulls and other decorative hardware? Please contact Hinges and Handles, which is a locator service that will try to locate something that will fit in the holes already drilled in your furniture. You may email a picture to hingesandhandles@gmail.com or call 800-533-4782. How do I find discontinued product? Bassett sends out a national "Want List" weekly to our retailers. Please supply you name, phone number and items you are looking for so that we may add your request to this list. If any Bassett retailer has these items, they will contact you directly within 30 days. Please contact us directly to use this service. While we do not offer gift cards online or in our corporate stores at this time, we do offer a Wish List on line, which is a great way to share favorite items with friends and family! I do not want to receive printed catalogs or emails from Bassett any longer. Can you please remove me from your lists? If you would no longer like to receive special offers from us in the mail, please visit the Opt-Out page and submit the form. If you no longer wish to receive email marketing messages from Bassett, please go the “Unsubscribe” link found at the bottom of every email we send. You can also select “Manage Preferences” and choose to limit the emails you’ll receive going forward. Does Bassett have financing available? Yes! Our Bassett credit card is issued with credit approval through Wells Fargo Bank, N.A. We are often able to offer promotional special financing for a limited number of months - please contact your local store or Customer Care Specialist for promotional details. The Bassett credit card is accepted online for most delivery locations and in our Bassett Home Furnishings stores, however, it is not accepted in the stores of our retail partners. You can apply online or at your local Bassett Home Furnishings store – please visit our online application to verify that you’re in an area where the card is accepted.